With epic breadth and intimate detail, Ludmila Ulitskaya’s remarkable work tells the story of three school friends who meet in Moscow in the 1950s and go on to embody the heroism, folly, compromise, and hope of the Soviet dissident experience. These three boys---an orphaned poet, a gifted yet fragile pianist, and a budding photographer with a talent for collecting secrets---struggle to reach adulthood in a society where their heroes have been censored and exiled. 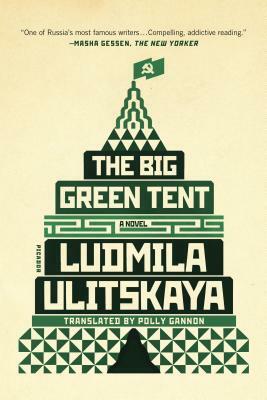 Rich with love stories, intrigue, and a cast of dissenters and spies, The Big Green Tent offers a panoramic survey of life after Stalin and a dramatic investigation into the possibilities for individual integrity in a society defined by the KGB. Each of the central characters seeks to transcend an oppressive regime through art, a love of Russian literature, and activism. And each of them ends up face-to-face with a secret police that is highly skilled at provoking paranoia, division, and self-betrayal. Ludmila Ulitskaya’s novel ultimately belongs to the tradition of Dostoevsky, Tolstoy, and Pasternak: it is a work consumed with politics, love, and belief---and a discovery of light in dark times. Ludmila Ulitskaya is one of Russia’s most popular and renowned literary figures. A former scientist and the director of Moscow’s Hebrew Repertory Theater, she is the author of more than a dozen works of fiction, including The Big Green Tent, several tales for children, and multiple plays that have been staged by a number of theaters in Russia and Germany. She has won Russia’s Man Booker Prize and was on the judges’ list for the Man Booker International Prize. Polly Gannon is the director of cultural studies at the New York-St. Petersburg Institute of Linguistics, Cognition and Culture. She holds a Ph.D. in Russian Literature from Cornell University and is the co-translator of Word for Word by Lilianna Lungina. She lives, teaches, and translates in St. Petersburg, Russia.